A Wiradjuri woman whose work with the community and the Charles Sturt University (CSU) Centre for Law and Justice has been acknowledged with a major award. CSU lecturer and researcher Ms Annette Gainsford (pictured) was presented with the Women Out West Award for Outstanding Community Leadership at a gala event in Dubbo last weekend. The Outstanding Community Leadership Award is presented to a woman who has tirelessly dedicated herself to improving the lives of others and bringing about positive changes in the community. Ms Gainsford said, "As a lecturer and researcher, my work in The Centre for Law and Justice enables me to work closely with Aboriginal communities at an urban, regional and remote level. Through my teaching and research, Aboriginal voices are empowered to create authentic learning experiences for our students. "I have the pleasure and honour of working closely with the Bathurst Wiradyuri Elders and they inspire me with their ways of knowing, they are very generous with their time and sharing of their cultural knowledge. "Many people at the University have assisted to nurture my learning journey and career, I will be forever grateful for the support and opportunities this has provided me. "I often assist younger members of the community with their university or career aspirations, and I hope that my learning journey can inspire others to achieve their goals. 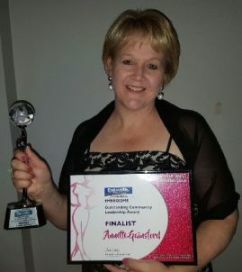 "My husband, daughter and aunty are very supportive of my work and attended the awards with me. Family is very important as they inspire and motivate all that I do." Director of the CSU Centre for Law and Justice and Associate Professor in Law, Alison Gerard, said, Ms Gainsford has been rightly recognised for her Outstanding Community Leadership. "Annette is a leader in social justice education and works tirelessly within Charles Sturt University and the community to build the Indigenous Cultural Competence of staff and students," Professor Gerard said. "Annette is a change-maker and we congratulate her on this recognition." for Outstanding Optimism - Awarded to a woman whose passion and optimistic outlook in life creates a happy, harmonious and inclusive environment where people flourish and great things happen. Contact CSU Media to arrange interviews with Ms Annette Gainsford. 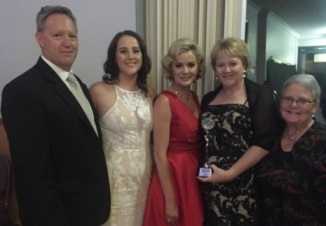 The lower picture shows Ms Gainsford and her family with presenter Sandra Sully (in red) at the 2016 Women Out West Awards event in Dubbo last weekend.